Prophets of the Ghost Ants is about as different a story as you are ever going to read (and given the sheer breadth of works around nowadays that is saying something). It's already been optioned for a film trilogy and has been lauded by such people as Lawrence Bender - the Oscar winning film producer whose credits include one of my favourite films "Good Will Hunting", not to mention Inglorious Basterds, Pulp fiction and An Inconvenient Truth. As you can imagine it has a lot to live up to, and yet it does so without even seemingly trying and is highly original - with some nods to classics such as Of men and monsters (by William Tenn) - it's an incredibly compelling novel that stands out amongst its peers. The story is set far in the future on an Earth that is unrecognisable, all signs of our current technologically progressive society have long since crumbled to dust, the causes of such cataclysms that would bring about such change have themselves faded into distant legend. Technology in this future vision is completely unknown as is most of the current animal kingdom. Mankind itself has evolved and adapted to survive in such a hostile environment, making the most of earth's dwindling resources by growing ever smaller each generation until they match the size of the only other major species to survive, that of the insect world. One of humanities greatest strengths lies in it's ability to adapt and the far future is no exception, forming a civilisation that makes use of some insect species as beasts of burden (including those of Ants) and much of human society is intimately connected with that of the insect, from food production to clothing to religion. This world of the nadir is a fiercely savage one where a strict cast system is ruthlessly enforced, a world where people are stalked by Night Wasps, Spiders and Grass Roaches while corruption is rife and those in power wage fruitless wars against one another. It's into this world that the lowly half-breed slave Anand is born, a dung collector from the midden caste - cursed to live in squalor and yet with a destiny that has the potential to lead his people against the seemingly unbeatable, genocidal army of men who ride the dread Ghost Ants. The thing that grabs you right away about this book is how different it is and its this difference that is both a blessing and a curse. It's a blessing as it's a breath of fresh air, the immersive nature and above average quality of the prose makes reading the book a real joy and the only novel that I've read that offers any form of comparison is the previously mentioned William Tenn classic. It's also a curse though as it took me at least a quarter of the book before I could accept that humanity had been reduced to such a small scale, it just doesn't seem possible that we could get so small as to be overshadowed by a Wasp or threatened by a Roach - If evolution did so much wouldn't it have also provided us with things like wings, compound eyes or at the very least some form of insect repelling defence mechanism?. After a while though I decided just to accept it and it's a credit to the author's penmanship that I did, the book is just so insidious, just so well written to make it seem that anything is possible. The author has clearly gone to the trouble of researching everything insect related - especially the Formicidae family (otherwise known as Ants) and it shows with vivid descriptions and a plausible sense of realism in how these creatures would inter-act and react to a tiny human population. The fight scenes - of which there are plenty against creatures such as wasps, centipedes, fleas and ants - are brilliantly choreographed and vividly described, as is the rest of the novel - I can see how it got picked up to be turned into a film as it has that cinematic quality about it. You really do get the feeling that these insects are macro sized, savage beasts. The story has a fairly steady pace and uncomplicated, easy reading style that would suit anyone from young adult age upwards. There are of course many messages within the book and I've no doubt that many will compare Prophets of the Ghost Ants to that over-rated George Orwell novel that some may have been forced to read as a child (not that I'm bitter or anything) but to my mind this book offers a much more effective comparison to oppressive regimes, the repression of the working class and the subjugation of women (amongst others) and does so without being quite so dark (or anywhere near as depressing). It does however manage to shock at times and effectively conveys the brutality and casual violence of such a society. 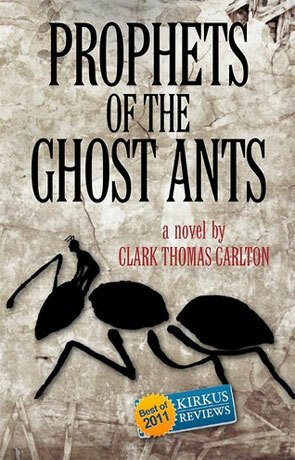 Prophets of the Ghost Ants is the first in a planned trilogy and I am eager to see where the author goes with this series, a rewarding novel that is remarkable for it's intensity as it is it's easy grace. Written on 7th June 2013 by Ant.